After so many people recommended Meetup a few weeks ago, I have really been making an effort to get out and meet new people and experience new things. I like the Houston meetups so far because they don’t fill up so fast. I often tried to sign up for Toronto meetups but they would fill up before I knew whether I could commit to the event. Houston also has quite a variety of groups. Since there are so many groups, it has become interesting to see which of my “interests” has people with which I click the most. My blog is mostly about healthy vegan food, so I picked a raw vegan potluck as my first foray into social gathering. The meeting was tucked at the top of Central Market, with a pretty view of the colourful aisles of groceries. However, the most beautiful produce was upstairs, in our room. The spread of delicious food was incredible. Foodie heaven! Lots and lots of salads. Some were more simple and others more elaborate. A lot of classic raw dishes, too: raw zucchini spaghetti with marinara, raw walnut tacos, guacamole and lots of delicious raw crackers. Zucchini pesto roll-ups were unique (and very good). I honestly thought there would be more desserts, but the two that were there were incredible: raw peach cobbler and superfood nut butter cups (I recognized Sarah’s recipe). I had master plans to bring Genevieve’s raw tropical jicama nachos but when I went to assemble the dish after work, my pineapple was not ripe enough and my peaches were screaming: eat me NOW! So, at the last minute, I ended up making this salad. It passed the taste-test with flying colours, and off I ran. As we each introduced the meal we brought, I felt a bit sheepish because I ended up picking a dressing with maple syrup, which is technically not raw. This is not a problem for me, and I think most people still tried it because there wasn’t much left by the end of the night. In any case, I thought it was delicious. 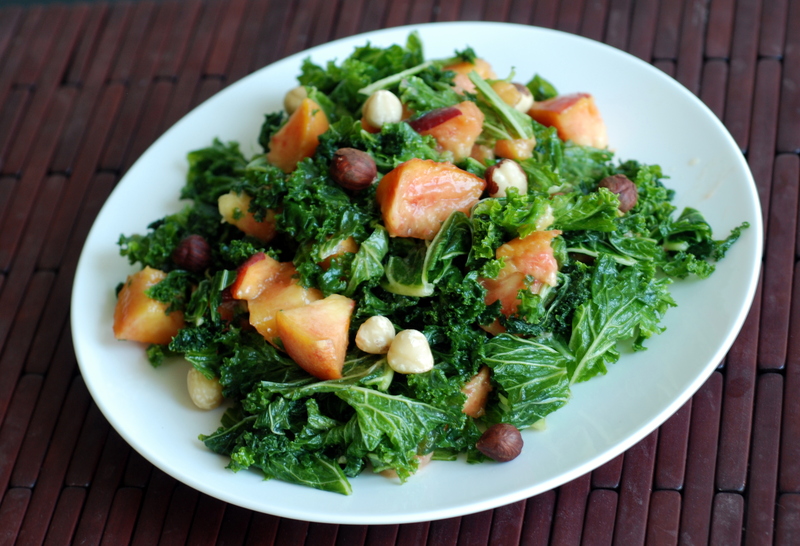 I usually eat my kale salads with a citrus dressing, but the maple-miso dressing worked really well with the sweet peaches, earthy kale and crunchy hazelnuts. It would be perfect for picnics, too. Have you ever been to Meetups in your city? 1. In a small bowl, combine the maple syrup, oil, apple cider vinegar and miso. Mix to combine. 2. 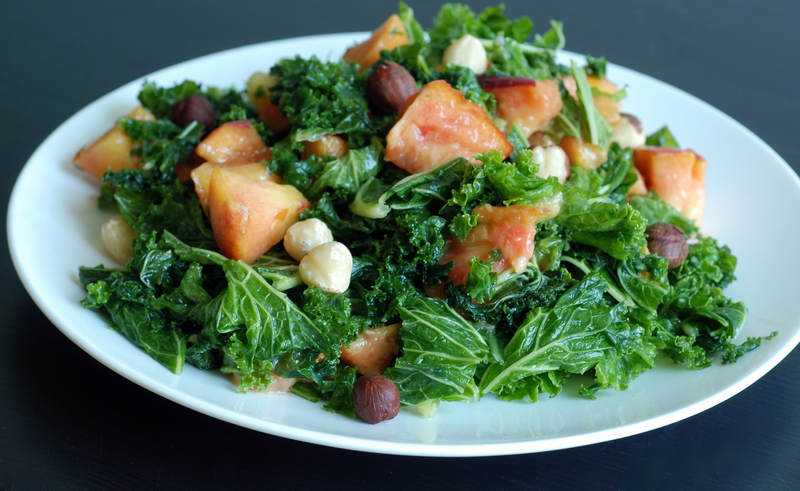 Place chopped kale in a large bowl and pour dressing overtop. Massage dressing into kale for a good 3-5 minutes, until it turns a darker shade of green and wilts down in size. 3. Stir in chopped peaches and sprinkle hazelnuts overtop. Ooh la la, getting all fancy with kale salad! This sounds intensely heavenly, I don’t usually buy hazelnuts which is for shame. Also I should totally look at Meetup, don’t really know anyone in Toronto yet! Forgot about that site! I am not a fan of coconut oil at all and use hemp and avocado sparingly as I have a bad family history of heart disease..Yes, I use Susan’s recipe and all no oil blogs and make oil free dal weekly. I also don’t use coconut milk but take almond milk and put coconut extract in it..
White navy beans or great northern beans might also work in more savory/herby dressings. I’ve also seen other people touting recipes subbing different veggies for oil, like peeled zucchini or red pepper. Do you have an oil-free salad dressing you like? I’d love to know if you do! I sense a theme here… but anyways, here are no-oil balsamic chickpeas with broccoli! Thank you all ..these are helpful..I just tried to make a roasted Brussels sprouts, quinoa and pomegranate salad with a lemon dressing but without the oil it just didn’t quite make it. I am not good at guessing what to make it better but I am determined to fool around with this one..I usually use the 3,2,1 dressing as it is the most healthy one and vary all the vinegars(have over 15) but am determined to live an oil free life! Wow, this looks sooo good! I never even thought about putting peaches in salad before. And with a maple miso vinaigrette – I have to try this!! Meetups are such a fun idea. I’ve joined a coupl groups’ email lists but never went. Need to get on that! Hey Laura, Just being a member is a great way to learn about events around town, too. I love that we live in a world where raw vegan potlucks are enough of a norm to be on a site like that, presumably regularly. You go girl! Yes! They are monthly, which is nice. The sad thing is that they are switching up the location. The old location (before it was Central Market) was literally a walk away from my home. I hope the next location will still be reasonably convenient. I signed up to get some meetup notifications years ago and still have not gone to ONE. I feel really awkward in a whole room of new people. But I really should try to put myself out there more! Good for you for doing it! Everything about this sounds great! Raw vegan potlucks always have the best food. 😉 It’s good you’re are getting to meet some new people. 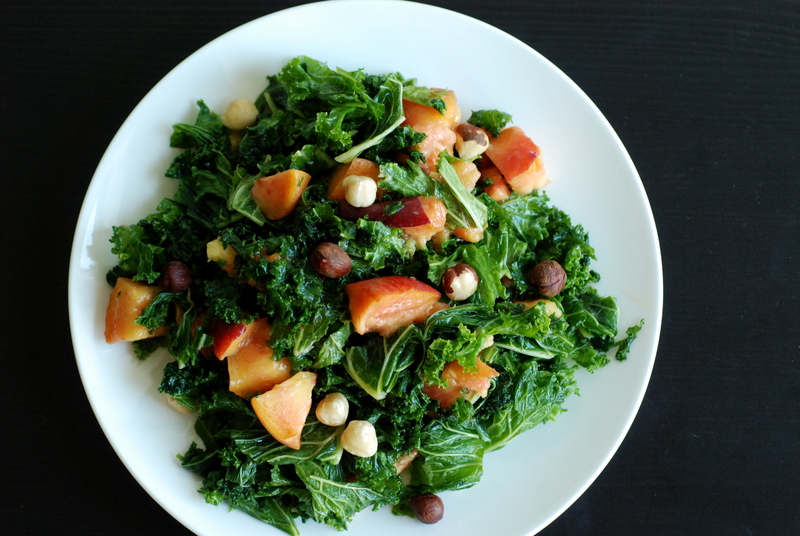 Love the peach-hazelnut-kale combination in this salad–what a great match! Thanks for sharing with Souper Sundays. This ticks all my boxes, I love kale salads and nearly always use miso in my dressings. Did you know that nearly all the kale sold in the UK has been shredded into small pieces? I long to be able to buy bunches of whole leaves. Mmm this salad sounds so good!!! My first raw vegan potluck in California also involved maple syrup and I was slightly chewed out for it I do know a fair amount of raw vegans that eat it – I still find it a much more healthy alternative to most other sweeteners. Glad you had some meetup success! I didn’t realise Toronto was so busy with the meetups and having things fill up so quickly, I haven’t really experienced this. Sounds like a fun meetup, I would love to try all that food! I didn’t even realize things like that existed…the nachos might have been a bit difficult for people to eat, so I’m glad you found a good substitute! Best to use up those peaches right now anyway!